Auguste Herbin (1882-1960), from a working class background, settled in Paris where he first joined the Impressionists and later the Fauves. 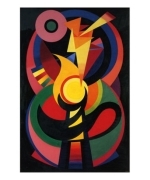 Like many artists of this era, his style developed over time from Cubism to an abstract, geometric phase before gradually discovering Constructivism. He briefly returned to figurative painting before his interest in a more concrete, strictly two-dimensional painting style with simple geometric forms. In 1953 a paralysis forced the artist to learn painting with his left hand. 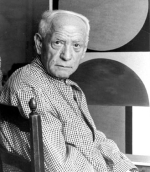 He became widely known and successful in the international art world. After his death, only one painting remained unfinished - it was called "Fin". This wonderful exhibition of his paintings called 'Rétrospective' can be seen at the Modern Art Museum in Ceret from 2nd March to 26th May. Cleverly grouped into the different phases of his painting styles it clearly shows the transition of the years as you pass from room to room.